I think we can agree that choppy markets are a common occurrence in the market. You can see these flat chart patterns in stocks, futures and sometimes even bitcoin. Choppy markets are tough to trade. If you try to buy breakouts, the stock will fail and roll over. The volume also dries up, and there are traps all over the place. So, what are we to do with these setups? What's the magic formula? Which indicators work best to increase your chances of placing a winning trade? Well in this post, we will cover how to trade during choppy markets by providing the following: (1) methods for identifying flat markets, (2) best indicators to use and (3) a winning trading strategy. When Does Choppy Trading Occur the Most? Why is Profiting in Choppy Markets so Difficult? A choppy market is a market without any clear direction. Choppy markets can present themselves after an extended bull or bear market has been in place. When identifying choppy markets, a trader must first locate the highest high and lowest low over many sessions. These two swing points will give you your range. The next thing to look for is how well the underlying security trades within this given range. If the security puts up a little fight when attempting to break through support or resistance, odds are the stock is in a choppy market. The markets spend the majority of the time in sideways patterns. If you think about it logically, how can the market continuously trend up or down all the time? A constant linear move up or down is not sustainable. Well, the problem with the fact the markets are flat the majority of the time is that it's in direct conflict with what you want as a new trader. Meaning you will approach each day with an enormous desire to make money and to make money fast. The market doesn't care what you want, so you will find yourself banging your head up against the wall as your desire for significant gains are not possible because the volatility is not there. So, as a trader, you will need to identify when the market is trending and when it is choppy. For trending markets, you will want to take fewer positions and let the market do the hard lifting for you. Conversely, with choppy markets, you will want to trade the ranges. When investing, choppy markets will show up outside of the quarterly review cycles because there isn't any real news to move the stock. Stocks will at times find some catalysts through the mention of a deal or a significant move by the broad market. Before we go any further, you will need to decide if you want to trade before during or after earnings. For me, when I was swing trading, I would not hold any position going into earnings. Reason being, my analysis had very little to do with the pending move due to the emotional reaction to the reports. Also, I would increase my trading activity when during earnings season because the trade opportunities were abundant. As a day trader, the time window for choppy trading is from 11 am to 2 pm. Now, this does not mean there aren't a few plays a day that make moves during lunch, but the vast majority of trades occur in the morning and then at the end of the day. I have written countless articles supporting this point, so I will not labor over it too much now. But the critical point to remember is during the middle of the day the market is exceptionally flat. Again, here you have a choice to make. 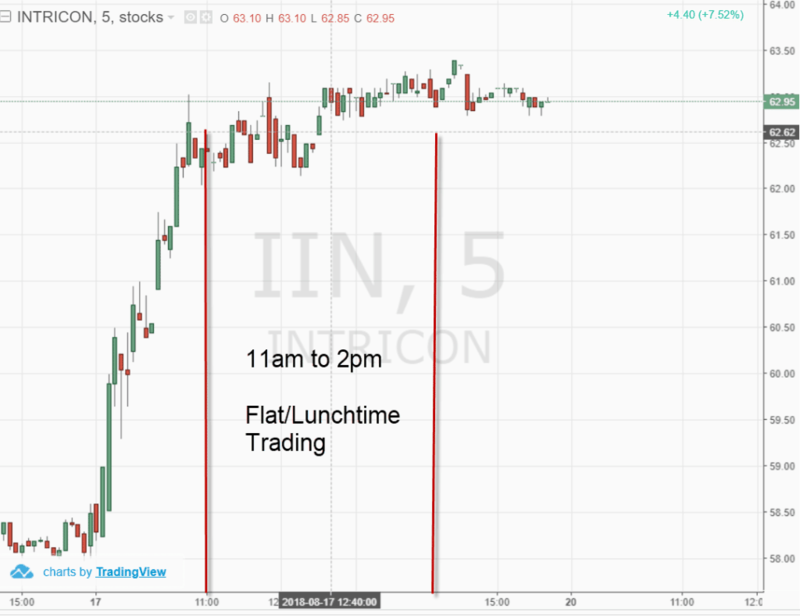 Do you avoid trading midday all together? I do as a part of my trading plan because I was never able to turn a profit with these setups. I will caution you that if you decide to trade the midday charts, you will need to play the ranges. Also, you will want to use an oscillator which can give you overbought and oversold readings. This will allow you to buy into support and sell into resistance. The challenge with profiting in choppy markets is two-fold. First, it comes down to the small size of the price moves and secondly when things go wrong - they go wrong horribly. The moves are small - relative to trending markets. So, you need to have a high winning percentage for this trading style to be worth your time. This means you need to shoot for the 60% to 70% win ratio level. These small moves will also require you to keep tight stops and tight profit targets. This way when you are wrong, you can limit your losses, and when you are right, you can book profits quickly. The other major challenge is that when things go wrong, they go wrong. Choppy markets are nothing more than the market building cause before it ultimately moves higher or lower. It's like a constant dueling match between the bulls and bears. The resulting declaration from these price battles is the breakout. 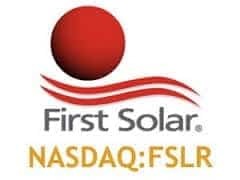 Depending on how long the stock is in a range and how much volume is traded in this price area will help you forecast the strength of the ensuing breakout. Remember, at some point the stock will breakout because again the market does trend 20% of the time. To this point, if you are, for example, short a stock as it breaks out - you must close your position without hesitation. If you are unable to admit defeat and hold onto the position, this is where things can get out of hand. Now imagine you are day trading and on average make .5% per trade trading the sideways choppy action. Then the unimaginable happens. After five successful trade signals in a row, the stock breaks out. At this point, you freeze and do not take action. The sock breaks out, and you continue to hold on. Before you realize it, your low volatility stock is now up 8% in three hours. Not only have you managed to erase your 2.5% worth of gains for the day, but you are also now down an additional 5.5%. This fictional series of events is my attempt at showing you how you could have an 83% win rate but still manage to lose money trading a choppy market. This will come down to preference again, but there are a few ways you can determine if a stock is moving. Fibonacci retracements are a quick visual way for determining if a stock is trending. A simple rule of thumb is that if a stock is continually retracing more than 61.8% of its moves, the stock is trading in a chopping pattern. Now, it's more than just retracing 61.8% once or twice. You need to see the stock perform 78.6% and 100% retracements over and over again. This will produce the trading range that you can use to identify buy and sell signals. 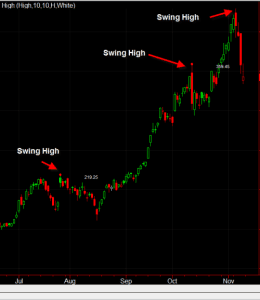 Another technique you can use for identifying a choppy market is price action. If you see multiple highs and lows in the same region forming a rectangle shape, you are likely looking at a choppy market. Still unclear of what this looks like? Go back and take a look at pretty much every chart in this post. Out of all the methods you can use to identify choppy markets, this is by far the easiest. This does not require you to draw multiple Fibonacci retracements or apply other indicators which you will need to interpret. It's merely a matter of drawing two horizontal lines and identifying the rectangle pattern. So this example is not about specific stocks but more your ability to track the overall volatility in the market. I have a proprietary indicator I have created to gauge market volatility. My indicator lets me know the market is flat if my list of possible setups is under 10. I can quickly see this by 9:45 am, at which point I make a conscious decision not to trade heavily during the morning. So, what is your indicator that you can use in a scanner to give you some insights that the market is choppy? There are a host of trading indicators available in the market. However, do you think momentum indicators will help you trade a stock that is trading sideways? Well, since the stock is range bound, wouldn't it make sense also to use an indicator that is bound by a range? Based on this theory, you will want to take a hard look at oscillators. 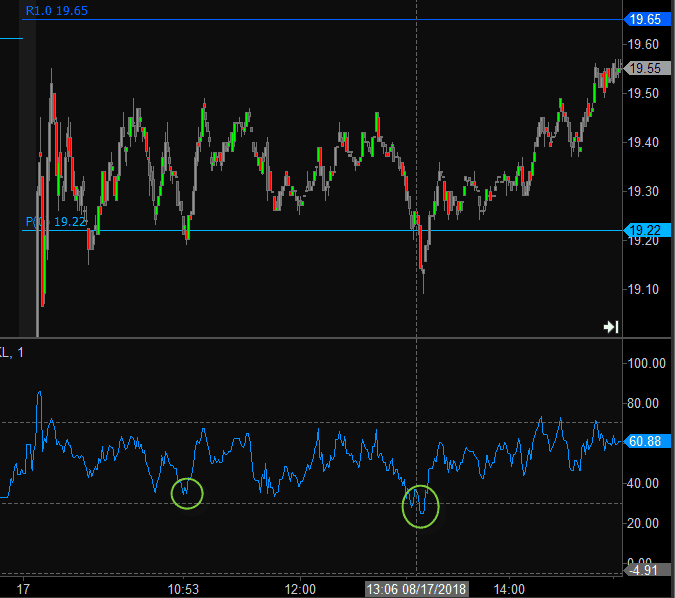 I use the RSI to trade in choppy markets. But why limit yourself there? 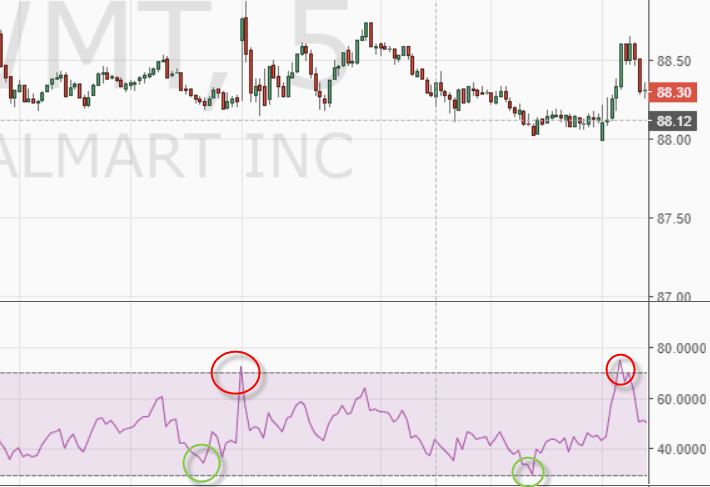 You will also want to test out other oscillators such as the Stochastic RSI or the Awesome Oscillator. There are two methods for profiting in choppy markets. The first method is to buy at support and sell at resistance. When stocks are choppy, there is not enough supply or demand to push the issues through critical levels. So, if a trader buys the support levels and sells resistance, one can net substantial gains. The second method for making profits in choppy markets is to utilize oscillating indicators. 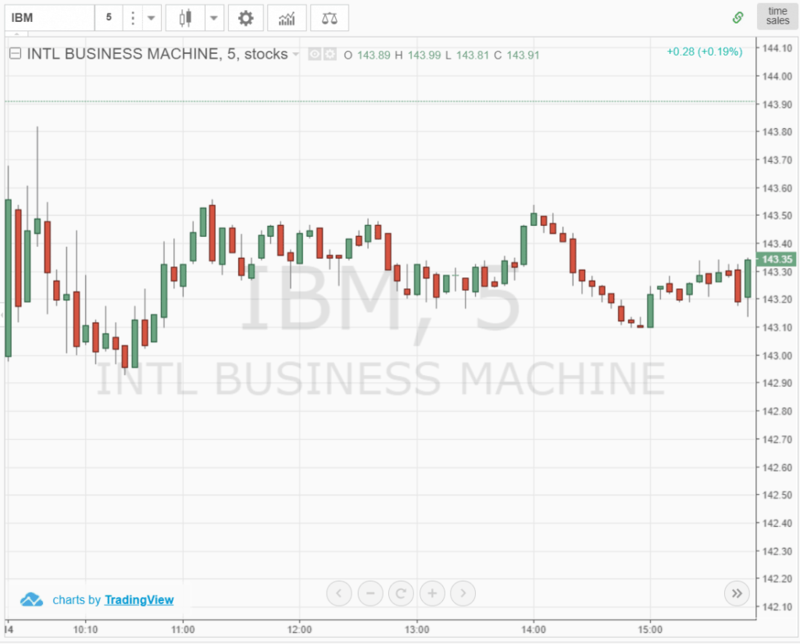 These indicators will provide buy and sell triggers based on price movement. When stocks are in choppy markets, traders play close attention to oscillators, such as the RSI and Slow Stochastics. Many studies have shown that oscillators perform best during choppy markets, due to the fact if a stock is trending, a stock can stay overbought or oversold for long periods of time. There are many trading systems you can explore when trading in choppy markets. 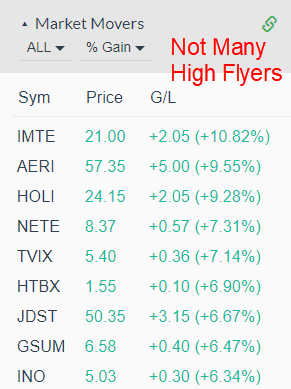 When trading these flat markets, I would highly suggest sticking to high float, high volume stocks. This way you can count on predictable price movements. You really want to see high volume to avoid scenarios where market makers will push a stock to trip your stops. A simple system would be to look for stocks hitting their pivot levels and overbought/oversold readings on the RSI. You can keep it that simple. Next, let's look at a trading example so that you can see this system at work. The above chart depicts a stock in a choppy trend. There are two key points to note: (1) low RSI readings right as (2) the stock is hitting the pivot point support line. This combination of extreme readings in the oscillator with pivot points can produce consistent results. Go back and look at your charts to see real-life examples of this strategy. You place your buy orders in or around the pivot point support area and then sell once the stock hits the high of the range. Remember, you have to keep those stops tight because once the stock finally breaks out, you do not want to lose a week's worth of trading profits. Before we wrap up this section, I need to leave you with a word of caution; volatile stocks do not care much for indicators giving their opinions on what should happen next. So please remember these setups and signals will not work as well with high beta stocks. It's simple - for me, I don't trade choppy markets. That's my hedging/risk mitigation technique for not overtrading and running up trading commissions. First, you need to identify the right setups. Next, you need to monitor stocks all day long. I don't have the time nor the desire to sit in front of the screen all day. You may read articles that tell you to buy bonds or invest in emerging markets. However, as a day trader, I can always find one or two setups a day. Now as an investor I again will say you have alternatives to hedging against the chop. 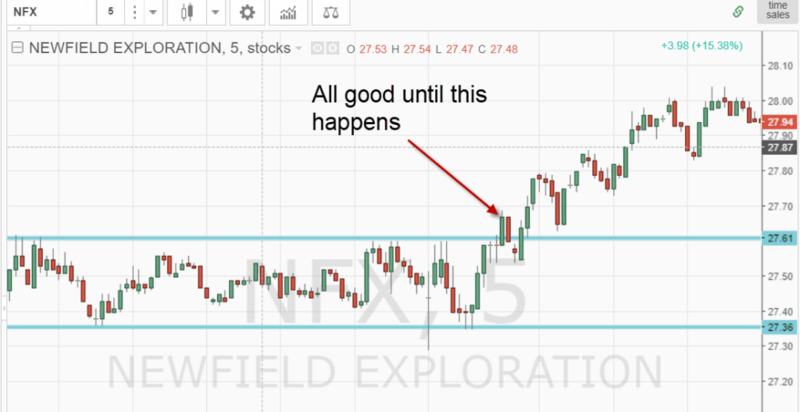 For starters, you can trade the sideways action as we have stated earlier in this article. Another option for long-term investors is to place your money in dividend stocks that can turn a steady return until market activity picks up again. Again, choppy markets are not good or bad. It comes down to your trading style. The key is deciding which one you are going to trade. If you are not going to day trade after 11, do not keep your chart open to keep an eye on the charts. Reality is at some point, the market will pull you in, and you will place a trade you regret. How can you possibly resist? If you found this post helpful, please head over to our homepage to learn more about Tradingsim. So give it a go. You can practice trading the futures and equities markets to see if you can turn a profit in choppy markets.